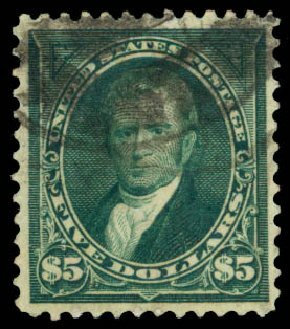 USA (Scott 278) 1895 MARSHALL $5 DARK GREEN Pretty copy. Fresh, very fine, original gum, lightly hinged. (2014 PSE Cert #01290184) Cat price $2000. 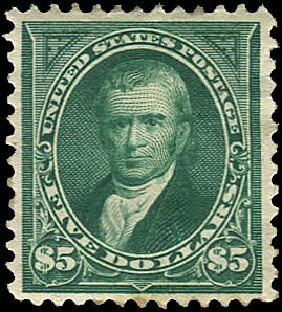 USA (Scott 278) 1895 MARSHALL $5 DARK GREEN Well centered, fresh color, very fine used single. Cat price $625. 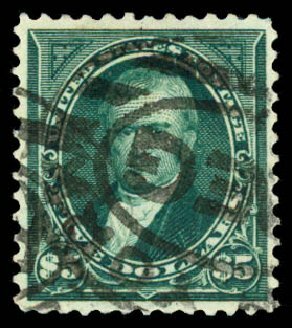 o U.S.; General Issues, 1895, $5 Dark Green, #278, registry cancel, Fine to Very Fine, PSE (2003) cert. Scott $625. Estimate price $200-250. 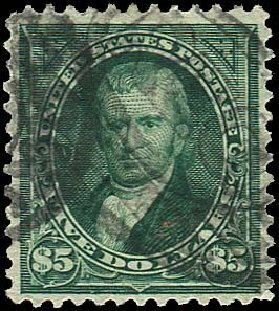 U.S.; General Issues, 1895, $5 Dark Green, #278, l.h., showpiece corner margin copy, separated and rejoined, Extremely Fine, PF (1978) cert. Scott $2,000. Estimate price $1,000-1,300. 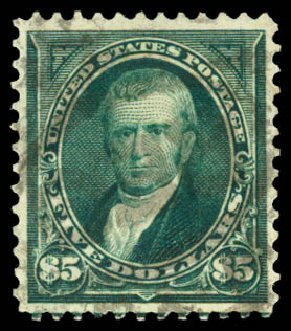 U.S.; General Issues, 1895, $5 Dark Green, #278, o.g., Fine to Very Fine, PF (1986) cert. Scott $2,000. Estimate $550-650. 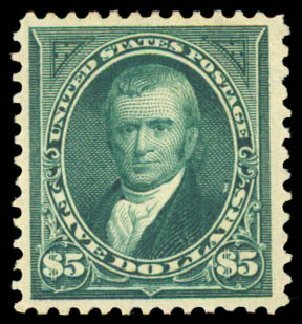 1895, $5 dark green (Scott 278), o.g., previously hinged, attractive example with gleaming rich color and beautiful large margins all around; tiny, well hidden internal paper break showing only in fluid, otherwise Very Fine to Extremely Fine. Scott $2,000. Estimate price $600 – 800. 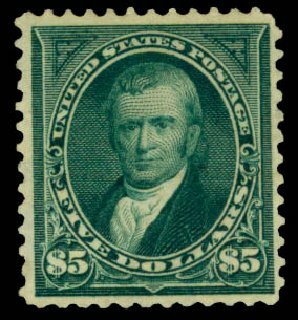 1895, $5 dark green (Scott 278), unused without gum, nice inexpensive key value, Very Fine. 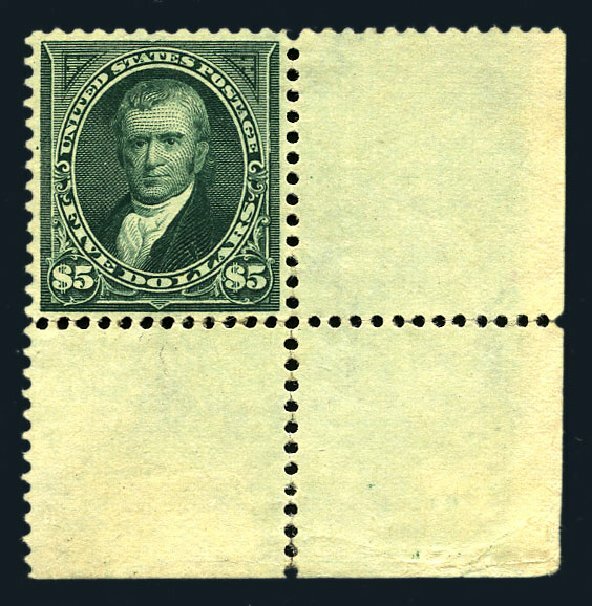 Scott $650. Estimate price $200 – 300. 1895, $5 dark green (Scott 278), light black cancellation, extremely fresh and appealing top quality stamp with vivid color and an unusually light postmark – scarce thus, Very Fine to Extremely Fine, with 2011 P.F. certificate. Scott $625. Estimate $500 – 750. 1895, $5 dark green (Scott 278), neatly struck registry cancellation, fantastic color and impression, a remarkable example of this surprisingly difficult stamp, Very Fine, with 2004 P.F. certificate. Scott $625. Estimate $400 – 600. 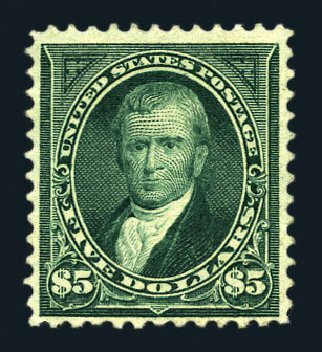 1895, $5 dark green (Scott 278), lightly cancelled for this stamp, deep shade, fresh; some hanging chad removed from top perforation holes (not noted in accompanying certificate) otherwise, otherwise Very Fine, with 1999 P.F. certificate. Scott $625. Estimate value $400 – 600. 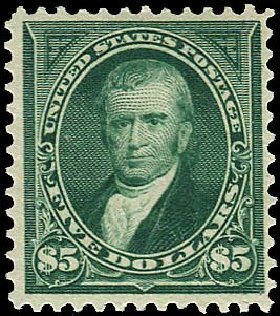 1895, $5 dark green (Scott 278), black cancellation, gorgeous deep shade, a sound and handsome stamp, Fine to Very Fine. Scott $625. Estimate $250 – 350. 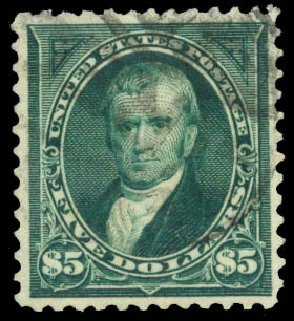 1895, $5 dark green (Scott 278), o.g., hinged, good looking example of this elusive high value, with dynamite rich color and finely etched impression, Very Fine, with 1989 P.S.E. certificate. Scott $2,000. Estimate value $1,500 – 2,000. 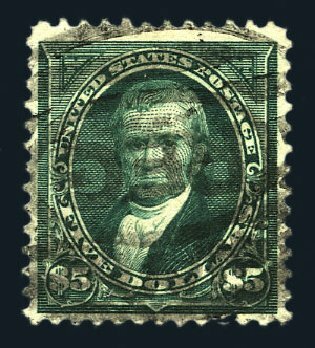 1895, $5 dark green (Scott 278), o.g., hinged (minor gum crease), extra large margins and dazzling rich color, a very desirable example of this watermarked $5 Marshall, Very Fine. Scott $2,000. Estimate price $1,000 – 1,500. 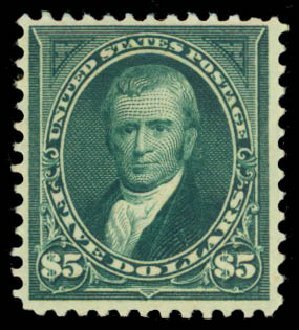 1895, $5 dark green (Scott 278), o.g., lightly hinged, exceptionally fresh example of this difficult stamp, a sound and attractive stamp featuring outstanding crisp color in a wonderful state of preservation, Fine to Very Fine. Scott $2,000. Estimate $1,000 – 1,500.